Posted on 04-01-19 at 8:21 p.m.
"We aren't against money, but money for what, if we no longer have the time to love each other or the time to take care of one another, if we spend our lives on the brink of burnout?" I have always wanted to do something with these fighting wordsby Catherine Dorion in her very first speech to the Quebec NationalAssembly, especially this epicquote that made the news over several days. Due to lack of time, this got delayed a few months but I can't resist coming back to it. It is true that today's society, the financialization of the economy and all the "disruptive" technological changes and innovations we are experiencing are forcing people to performmore than ever before. Most organizations are constantly re-examining themselves and asking more of their employees in order to adjust to the emerging demands of markets and society. Madame Dorion's heartfelt cry is therefore very understandable. On the other hand, in light of such a judgment on the socioeconomic conditions we face, along with a collective wish to turn the tide, I was eager to find an echo of this sentiment in people's personal lives. And it is in this context that I found the results, in the form of personal values, that allow me to distinguish those who prefer money from those who are driven more by personal fulfillment (and by love, as Madame Dorion would say). Clearly and overwhelmingly, people prefer personal fulfillment to money, 80% opting for statement B versus only 20% for statement A(with rounding). Note: these results are nearly identical for Quebec. Given such results, Madame Dorion would probably say, in keeping with the logic of her speech to the National Assembly,that it is high time to incorporate social regulations to better manage the socio-economic pressures on people and to help them adjust better to these shared aspirations. Young people: those Millennials again? It is interesting to seeinthis question's results that there are very few significantvariations by sociodemographic or socio-economic characteristics-with the exception of young people (under 35 years of age). While 20% of Canadians prefer money over fulfillment, 34% of 18- to 34-year-olds do (40% of 18-24 year olds and 30% of 25-34 year olds-and the same data and differences apply in Quebec). Obviously, in the face of such differences, one's first reflex is to see this as yet another expression of this singular generation, the Millennials. But, similar to my findings for this generation in one of my last posts, these differences are less reflective of a new generation than the fact that we are dealing simply with young people. Ten years ago, we asked a similar question, pitting money against fulfillment at work, and young people back then then had also been strongly over-represented on the money side. Basically, what attracts people to money is the irresistible,seductive power of consumption and the social status it confers. For them, money is theleverfor becoming someone in society. Consumption itself provides a unique type of gratification, as well as access to the status associated with having the means to climb the social ladder ("Keeping up with the Joneses"). It is also interesting to observe that these people have a certain predisposition toward civil disobedience, as if any way of moving up in the world is legitimate! Also, and perhaps of most interest, is the fact that they feel especially overwhelmed by the demands of life. Most of them have the impression that life is passing them by (64% of those motivated by money versus 51% for society as a whole. See the next tables.). For them, family comes first. They want to have meaningful and authentic relationships with the people around them. They are sensitive to current social and ecological issues. They want to do their part to make the world a better place. They are very concerned about equity and equality between men and women. They feel a part of nature instead of in a position of dominance over it (a kind of ZenBiomanist). Harmony and fulfillment are at the core of their values (and love, too, as Madame Dorion would say). On the other hand, on the issue of feeling overwhelmed by the demands of life and that they are missing out, they also express some frustration (49% compared to 51% for society as a whole. See the tables above). They want to put their fulfillment first, but feel pressured by society and the pace of life. Note that the profile of those who "slightly prefer" an average income and a fulfilling social and family life (31%) is not very characteristic and is not at all directed towards harmony, unlike the previous group. Instead, they express a rather nonchalant hedonism, as if they find the effort required to pursue the almighty dollar more trouble than an authentic and deep search for fulfillment! Is it possible to slow down the pace? In her canonical speech, it seems that Madame Dorion put her finger squarely on a very real shared feeling, one that encapsulates our era for many of us. 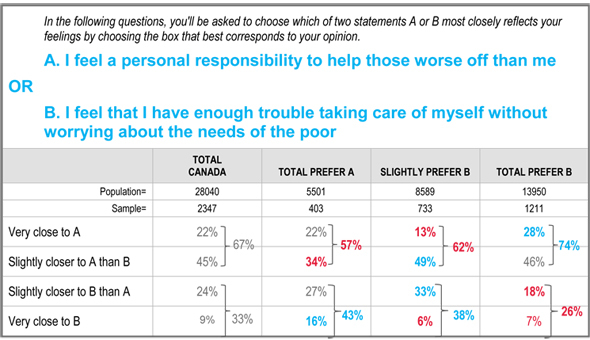 One in every two Canadians feels that life is passing them by (51%, exactly the same percentage in Quebec),and an equivalent percentagelongs for a fulfilling life even if the trade-off is having only an average income. Madame Dorion's heartfelt message was a call to reflect on the frantic pace of our lives and what we cando collectively to put a little more balance in them. However,given our world of globalized, financialized markets and continuous technological change, is it even possible to find this kind of life balance without compromising the health of our economy, our livelihoods and the economic future of our children? I do not pretend to have the answer. But I believe that we need to have this discussion. Unfortunately, Madame Dorion's speech went nowhere. For this post's musical clip, I thought Rossini'sCinderella would be just the ticket. In this aria ("Cenerentola, vien qua"),poor Cinderella is having trouble keeping up with the incessant demands of her despicable stepsisters.One gets the feeling that if the pace of these demands continues, Cinderella could well find herself on the verge ofburnout! Rossini: La Cenerentola– Elina Garanca, Lawrence Brownlee, Cesare Lievi, Gary Halvorson, Maurizio Bellini, The Metropolitain Opera Orchestra and Chorus, Deutsche Grammophon, New York, 2009. Posted on 03-27-19 at 1:38 p.m. So, you want to maximize your sales, the engagement and loyalty of your target audiences, and the success of your marketing and communication campaigns (ROI). No problem! We've got just the solution for you. The fieldwork for our annual Panorama program is now in full swing, so we invite you to submit your key target audiences, the ones that make a real difference to your bottom line and the success of your campaigns. When Panorama is done, we'll be able to tell you everything you need to know about your key targets to maximize your conversion rate, along with what drives and triggers consumer decisions and public attitudes. Click here for an example of what we can do with Millennials (the group on every marketer's mind these days!). If you read my blog of February 12, you'll see that in this document I went much further in my analysis, adding recommendations on how best to sell to Millennials to increase your ROI. But we can perform the same type of analysis on any of your targets and audiences. Don't be shy. Give us a call! Posted on 02-26-19 at 3:37 p.m. I am often asked if the debates, discussions and controversies raging on social media are representative of the concerns of the general public. The question is whether social media truly reflect what people say and think in the real world. To all those who ask themselves that question, even if only occasionally, the answer is NO! Absolutely not. And I say that without hesitation. We can examine this question two ways: purely quantitatively or more qualitatively. Our studies indicate that among all social media users, three out of ten (29%) post comments, opinions or content of some kind; seven out of ten (71%) are happy to read what others are saying or observe what they find there without commenting. Consequently, the debates, discussions and controversies we find on social media are the views of a minority of us (a phenomenon that is, curiously, only slightly more pronounced among young people). Therefore, one must be very careful before generalizing the concerns expressed on social media to the general population, since those voicing their opinions represent fewer than one in three people in the population. On the other hand, if each of these individuals were randomly selected, reflecting all the different characteristics of the population, we could say that they truly represent a very large sample and that we could consider them as representative of our entire society. But that's really not the case. Despite differing very little from the general population on a socio-demographic and socio-economic level (perhaps a tad younger, and no differences in Quebec in case you were wondering), in terms of personal values, hot buttons and motivations, they are highly distinctive! Above all, they express themselves on social networks ... because they have a powerful need to express themselves, to speak out! The content they post is secondary to their urgent need to be heard, to have a platform! What's more, those who have this need to express themselves on social media do so relatively often. They are strongly overrepresented among those who log in to the various social media platforms at least once a day, if not several times a day. 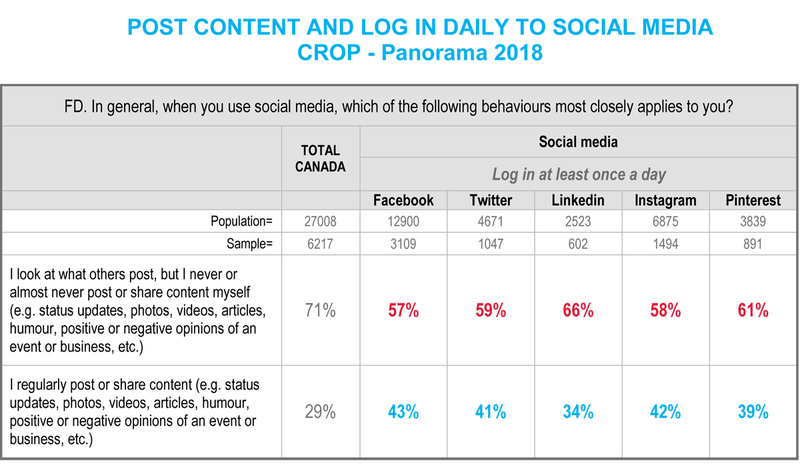 To avoid overwhelming you with too much data, I have crossed in the table below those who post content at least daily with those who only view content, by how frequently they make use of the various platforms. This makes their busy usage all the more obvious! When we analyze the values of the people who post/share on social media, we clearly see that we are dealing with a very specific group of individuals. 1. First and foremost, a need for recognition, to be admired by the people around them, as well as by society in general. A need to feel proud, to be praised, to experience status recognition. People feel proud of themselves when they think they have said something "significant" on one (or more) of the platforms they use. 2. A need for stimulation, to be on the leading edge of whatever is new and innovative, both on the market and in society, especially the latest products and services, which is what engages people in these discussions. This expectation expresses a need for gratification, as well as a need to feel proud: they want to be the first to take advantage of these innovations and sources of gratification ("Early Adopters"). 3. A need for self-expression, to express their uniqueness, creativity, their sense of being special and a need to express this loudly and clearly. Again, social media gives them a way to fulfil this need for self-expression. 4. A need to connect with others, to cultivate their network, to maintain emotionally meaningful relationships with others. 5. A desire to help improve the world ("changing the world" may be a little presumptuous). 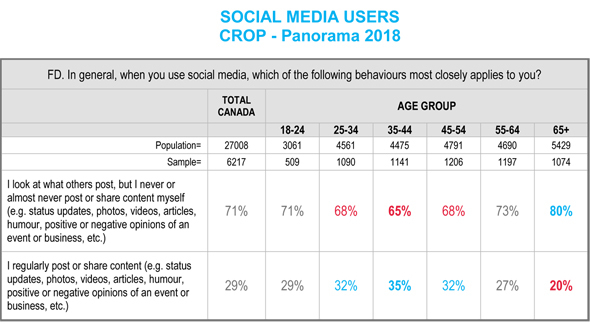 Curiously, the latter two motivations are less pronounced among the most active social media users, but very apparent among the less active users. The following tables present the results of a few questions measuring some of these motivations, crossed by the most active users of these social platforms. The indicators expressing a need for peer recognition have markedly higher indexes for the frequent (daily) users of social media networks, which leaves no doubt as to their motivation. Clearly, there is some vanity involved here! People post/comment to be recognized, regardless of the topic being discussed. At times, the vehemence surrounding certain issues offers them a great opportunity to loudly proclaim who they are, no matter the issue at stake! It is also interesting to observe the convergence in the social media platforms. We searched in vain for differences in what motivates the use of one network over another. On a tangible, concrete level, the platforms have different uses, but the deep motivations for their use are the same for all of them: the need for self-expression and the inspiration to speak one's truth! How representative is this voice? The diverse points of view found in our society cannot, therefore, be expressed in a representative way by the people who post or share content on social media. While we should take what they say into account, they represent only one, albeit a particularly loud, voice. But they do not represent public opinion. How many times have business owners called us to say that their brand's reputation was in tatters because of a social media controversy. After we checked with (polled) their stakeholders, it turned out in most cases that only a small minority shared the accusations against them. So yes, we must pay attention to what's being said on social media, but we must also learn not to give it more weight than it's due. Please forgive me for revisiting La Traviata, but this time I want to present a lesser-known aria, along with a unique interpretation of the opera. Anyone who knows even a little about this opera and the novel on which it is based, The Lady of the Camellias by Alexandre Dumas fils, knows that it is a sad tale of impossible love that ends in the dramatic death of the protagonist, Violetta. However, French philosopher Roland Barthes had a radically different take on this work. He maintained that its primary theme is not love, but the desire for recognition! (Mythologies, 1957). Violetta engineers her social life and even her love life in order to be recognized: her ultimate goal is social recognition. In this clip (Addio del passato), Violetta, now at the end of her life, sings that she took the wrong path to get what she wanted, that she has become a fallen woman, a traviata (the only time this word appears in the opera). Verdi: La Traviata – Covent Garden & Orchestra of the Royal Opera House, Covent Garden & Sir Georg Solti Angela Gheorghiu & Frank Lopardo & Leo Nucci & Chorus of the Royal Opera House, London, Sep. 19, 1995. Posted on 02-12-19 at 4:53 p.m. In response to this avalanche of random hypotheses, I felt I needed to take stock of this generation. Every year, through our Panorama program, CROP measures a hundred or so values and hot buttons, which allows me to weigh in on the various opinions that everyone seems to have about this age group. A question of age or generation? Technically, Millennials are considered to be young people under the age of 35. We like round numbers in my field, but Millennials are, in fact, between 15 and 37 years of age because they are born between 1982 and 2004. But to say that they represent a generation with radically different values from previous generations is perhaps a bit of an exaggeration, because young people are first and foremost ... young people! Our studies have shown that much of their distinctiveness comes from the fact that they are in the prime of life, and in all recent eras, young people have radically distinguished themselves from their parents. At this age, hormones play a role and they also want to be recognized for their uniqueness. There is nothing new here, except that this generation is even less inclined than previous generations to sacrifice their quest for pleasure for their obligations, which is why they are less engaged at work - not to mention the fact that companies are far less loyal to their employees than in the past. One area where Millennials stand out - in fact, all of society is different than before on this aspect - is consumption. 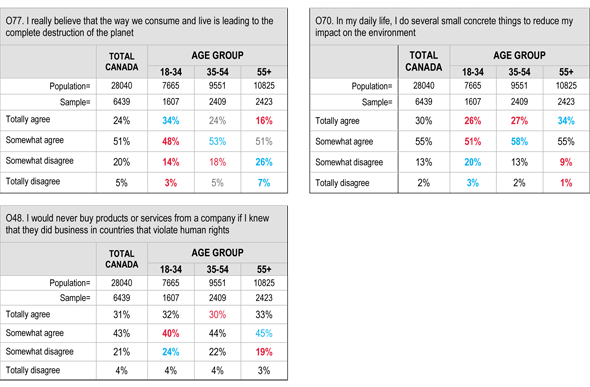 For a majority of us, consumption has become one of the central values of our lives. But on this aspect, Millennials are pulling society and the marketplace forward. They live to shop. Their hedonism and quest for status are systematically invested in consumption: they want to be proud to display what they own in a social context and the innovations they want to be the first to adopt. Where they radically differ from previous generations and older people is their comfort with new technologies and their willingness to use new technology to interact with the world, with others, with companies, brands and the media. However, it is less a question of values than of economic and technological context. Millennials were born and raised in a unique era of innovation, and the flexibility that they have at their age has allowed them to reap all its benefits. When it comes to innovation, again, they are pulling society and the marketplaces forward. Where I think Millennials are overrated is their supposed commitment to social and ecological causes, something I certainly hear a lot about! Well, on this score, they are certainly not in the lead. They may demonstrate strong ecological alarmism, believing that the planet really is truly doomed. But, despite that, they aren't particularly committed to helping improve the lot of society or the environment. It is as if these issues are beyond them. They believe that they can only make a marginal difference and prefer to see companies and institutions intervene. 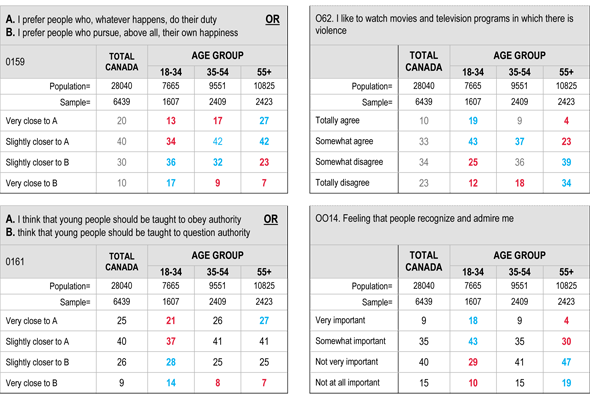 Shortly before Christmas, I published a blog about the tool we use to segment Canadian consumers, which, when crossed with age, sheds a lot of light on the values of Millennials. Clearly, we find Millennials overrepresented among enthusiastic consumer segments with various motivations that we find among youth, while Idealists, the most committed to advocating and acting for social and ecological causes, are clearly under-represented among the young and overrepresented among older people. 6. A feeling of helplessness resulting in weak social engagement. We also measure other characteristics that define this group of young people, but I have focused here on the most salient points. It should also be noted that, quite surprisingly, this portrait of young people does not vary much across the country, even in the usually distinct Province of Quebec. Finally, my goal is not to criticize this group of young people but to highlight their dominant features, so that those who want to target them have a better idea whom they are dealing with. What could be a more perfect musical metaphor for youth than Puccini's La Bohème? All the key elements of this stage of life are beautifully expressed in this opera: love, passion, recklessness, distrust, camaraderie, etc. The selected excerpt is the first love scene between the two main characters. This is the moment when the heroine presents herself to her suitor in one of the most beautiful arias in the entire operatic repertoire, sung here by one of the greatest sopranos of our time, Anna Netrebko, the Maria Callas of our era, in my opinion. Giacomo Puccini: La Bohème – Netrebko, Beczala, Gatti, Wiener Philharmoniker, Deutsche Grammophon, Salzburg, 2012. Posted on 01-30-19 at 2:16 p.m.
You've probably noticed that your e-mail inbox is filling up faster than before, unless you have very efficient anti-spam software. The reason is probably that the companies and brands you deal with have begun communicating with you more directly and more persistently. CROP has just conducted a major study on this topic for its clients. Our findings and implications not only offer specific guidelines to companies, but also insights into what our society is in the process of becoming! In a single month, we estimate that eight out of ten Canadians (83%) get digital communications from companies or brands in the form of newsletters, promotional offers or discounts (emails, text messages, notifications or alerts on their smartphones, tablets, computers, or on social media). Increasingly, companies are processing the data they have on you-your purchase history, your web browsing, your Facebook profile, the surveys that you fill out with them-which they incorporate into their databases (yes, CROP does this, too). Then, they "decrypt what you need" to sell it to you by means of personalized communications (using all the methods mentioned above). The spread of these business practices is such that it raises important societal issues. First of all, the fact that people's personal data is being used for marketing communications purposes is provoking endless debate. Voices are being raised all over the world to demand more protection and guarantees regarding the use of personal data; collective grievances to which governments are not insensitive (the use of Facebook data being a case in point). Still, advertising has been a part of our lives since the beginning of the consumer society. Its business model is based primarily on the interruption of our media and content experiences to present us with offers. In this respect, one should keep in mind that these media experiences would not be possible without the revenue generated by these interruptions, since advertisers are paying to place their ads. This is the traditional media model. But the very nature of this type of communication means that it is often not relevant to many people. If, for example, one of your favourite shows is interrupted by an ad from a car company when you do not need to change your car, you may get bored and irritated. This communication is not relevant to you. Consequently, the key word here, the Holy Grail, sought by all these methods is: relevance! A clear trend is spreading, where we find more and more people abandoning traditional media for content available on alternative services provided by Apple, Google, Netflix, Spotify and other web providers and mobile applications. Such content is certainly considered more relevant by users than what is available on traditional media. Advertisers are also abandoning traditional media en masse. They are increasingly advertising on platforms that are better targeted to the consumers they seek by attempting to be more relevant to them, thus putting several traditional media (especially newspapers) at risk. Personalized communications by e-mail or other means are all part of this trend: they are trying to reach us individually with targeted and relevant content. But this purported relevance doesn't always happen. Half the people (50%) who get brand and company communications have unsubscribed from at least one brand in the last six months, judging the content to be irrelevant to them (too much useless content, lack of interest, etc.). The danger is very great for brands and companies that send out irrelevant content to people. Such communications may harm their relationship with their customers / users. (CROP uses its expertise in this area is to help companies be more relevant). But here is the paradox, the irony: everyone is seeking relevance - people, consumers, users, customers, as well as the businesses and brands that communicate with us. But to be relevant, you really have to know who you are dealing with: your audiences, your customers, your users, your consumers. Hence the use of databases, the "Big Brother" who is spying on us: who says that it's all to serve you better! And "he" is right! To communicate effectively with us, to be relevant and to serve us well, companies must know all about us. That is why they are applying artificial intelligence algorithms to the databases containing data on us. Despite all the societal debate surrounding the storage and use of personal data, these practices are still fairly well accepted. Two out of three people in the country (67%) feel comfortable with their purchase history being stored in corporate databases in order to personalize the communications they receive. Three out of five people (59%) feel comfortable having their web browsing history used for the same purpose. However, while these findings indicate a certain degree of acceptance, the 33% of people who feel uncomfortable with the use of their personal purchase history and the 41%, with the use of their web browsing history still represent a lot of people in the country. People are divided on this issue. Social movements can erupt with less support than that! These people need to be reassured. They need to be shown that their data is only being used to deliver more relevant content to them. What people accept the least (39%) is having their physical movements tracked via their smartphones, whereas, without meaning to overly gild the image of my industry, the use of a person's survey data is considered the most acceptable, with three out of four (76%) feeling comfortable with this practice when it is used to personalize the communications they receive. Note that older people (55 years and up) have the most reservations about these practices, while younger people (18-34 years of age) are the most comfortable with them. In terms of what they receive, 50% of Canadians say they are satisfied with the quantity of these communications, 45%, with the frequency, and a noteworthy 45% with their relevance. 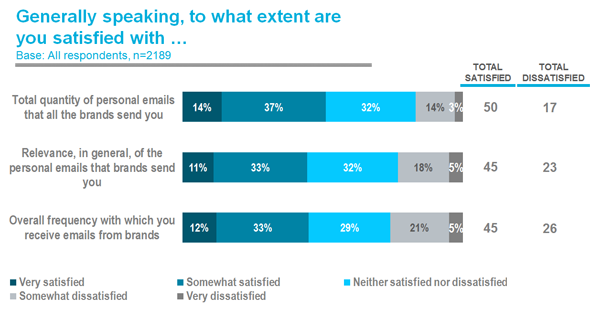 While dissatisfaction rates are not very high, they are still significant: 17% are dissatisfied with the quantity; 26%, with the frequency; and 23%, with the relevance. What is striking are the rates of indifference (neither satisfied nor dissatisfied): 32%, for quantity; 29%, for frequency; and 32%, for relevance. But this is where the problem lies: the rather mixed satisfaction with the relevance of the communications they get. Marketers want to replace mass communication (via traditional media) with direct communications (e-mail, social media, etc. 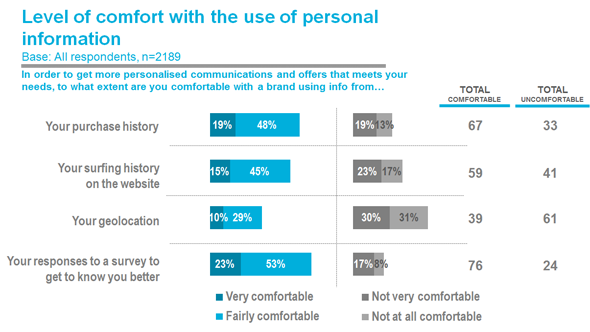 ), but truly relevant personalization has been slow to arrive. Note that all these indicators are relatively correlated with each other. We can clearly identify an acceptance versus a rejection "factor" with regard to the use of personal data for commercial communications purposes. The perceived relevance of what people get is at the heart of their attitude to these practices. The current grumbling against these practices would be less if the relevance of the communications hit closer to the mark. Moreover, when we examine the values of the people who are satisfied with the relevance of what they receive versus the values of those who are not, we find a mix of consumerism and a need for stimulation, Inspiration and the expression of their potential and creativity as opposed to an anti-consumerism culture firmly rooted in the belief that companies are doing everything in their power to create artificial needs to push people to buy stuff they don't really need. These people certainly do not see any relevance to them in those communications. In fact, the use of personal data has become such a societal issue that it is dividing people along radically opposing values. Our consumer culture has exploded in recent years. Increasingly, we value innovation, new products and new technological applications that transform our lives, stimulate us and potentially leverage our personal development. For these individuals, if the price for accessing offers and content on these thriving markets is that they must allow access to their personal data, they figure it's a fair bargain. This type of consumer is strongly on the rise in the country, which explains why there is a majority of individuals on the side of acceptance. In contrast, the most socially critical people, whose numbers are stable but still impressive, tend to believe that companies are not behaving ethically. They want to contribute to a better world, socially and ecologically, and for them, the utilisation of personal data is yet another manifestation of a purely mercantile approach by companies with no social conscience. Admittedly, few companies know how speak to these individuals in a relevant way! Despite all the issues and criticisms surrounding the use of personal data and the regulations to come, this industry shift is underway and unstoppable. Every day, artificial intelligence is coming up with new ways to "relevantly " this data, and the more relevant it becomes, the more socially accepted it will become, too. Let's hope it doesn't take too long for this this relevance to make itself felt! For my musical clip of the week, I was unable to find any operatic examples of personalized communications using databases of personal information! But the sending of a love letter is an ideal pretext for some nice music (after all, what's more personalized than a love letter!). What is known in the opera repertoire as "the letter scene" in Tchaikovsky's opera, Eugene Onegin, provided me with the perfect excerpt to round out this blog post. Eugene Onegin is a young heir, idle, cynical and nonchalant. Tatiana, a young naïve country woman, falls madly in love with Onegin. Consumed with love for him, she writes him an ardent love letter. But Onegin rejects her. Tchaikovsky - Eugene Onegin / Fleming, Vargas, Hvorostovsky, Gergiev, Carsen, The Metropolitan Orchestra and Chorus, Decca, New York, 2007.